Frank Belknap Long had something his more famous friends never did: a long and varied career. Most famous today as HP Lovecraft's closest friend, Long was a writer of weird stories and science fiction in his own right and not just a footnote to the Cthulhu Mythos. 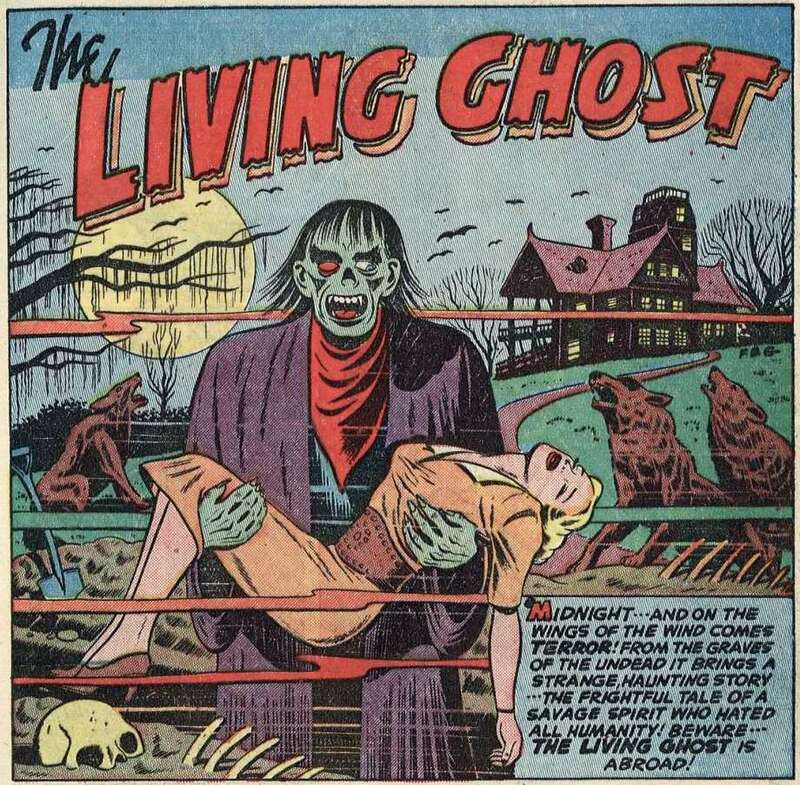 Along with writing pulp science fiction and horror, Long also was one of the first to write horror comics and set in motion the 1950s craze that would include the famous EC brand of the genre. 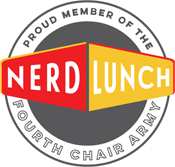 In 1940, Long followed several other pulpsters such as Otto Binder and Manly Wade Wellman into the comics field. (Later Edmond Hamilton would contribute to the world of Superman, and in a weird reversal, comic artist Harry Harrison would become the science fiction writer of Stainless Steel Rat fame.) After a few superhero scripts Long joined ACG in creating the first, continuous, all-horror comic, Adventures into the Unknown. 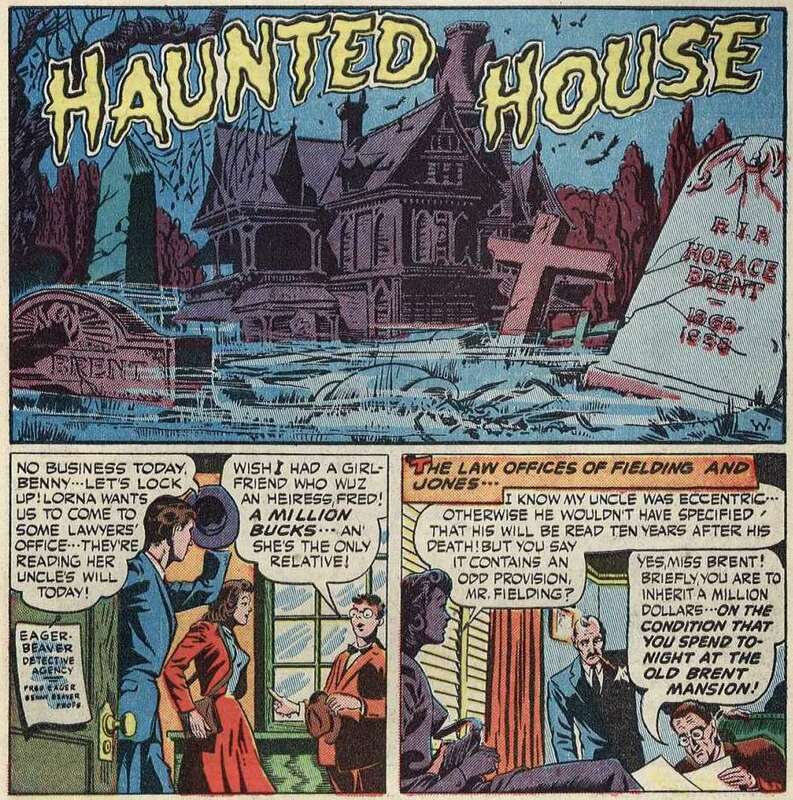 (There was Avon's Eerie in 1947, but it did not publish another issue for four years!) 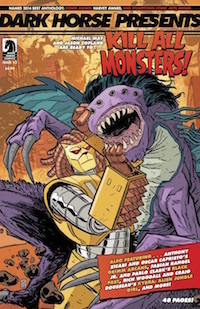 Frank would write the entire contents of the first two issues before moving onto other projects. 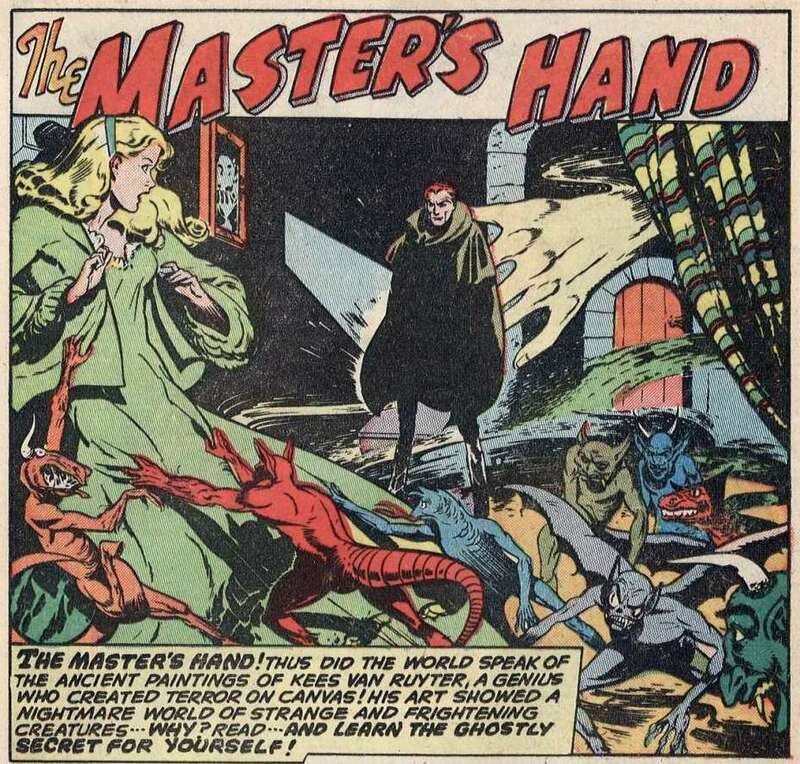 His run was short, but in those two issues he set up what would become the standard style for horror comics, based on the feel and topics found in Weird Tales magazine, while also paying homage to the great-grand-daddy of them all, the first Gothic writer, Horace Walpole. "The Werewolf Stalks" was, appropriately enough, the first story in this comic. In the wilds of Canada, a hunter of zoo animals captures a wolf, only it's something else that will terrorize the team that caught it. Many werewolf comics would came after it (and let's be honest, some had preceded it, too). Long was particularly fond of this tale, mentioning it to August Derleth in a letter. And fond he should be, for he puts some twists on what could have been a very ordinary werewolf story. The art was by Edvard Moritz. "The Living Ghost" is the most famous creation in the first issue of AitU. The green faced monster with one red eye exists only to kill and cause ill. He murders the operator in a train switching station to cause two trains to collide, then laughs over the death and destruction. Gail Leslie, girl reporter, teams up with Tony Brand, the DA's special investigator, in finding the phantom. Gail and Tony capture the ghost with the help of Dr Vandyke but the fiend escapes for more adventures. The art was by Fred Guardineer, who gives it a manic, cartoony feel that I enjoy. A more realistic look might not have worked as well. Guardineer, more than anyone, has the EC feel before EC Comics existed. After a single pager on voodoo rites, Long writes a text story called "The Painted Grave." Taking a page from Lovecraft's "Pickman's Model," John Drake is an artist who wants to create the most horrific artwork. His masterpiece is a graveyard scene where something rises and leaves the painting, grabbing the artist and hauling him back to that fearsome grave. HPL's shade would nod approvingly. The text was set by Edmond Hamilton of all people! "It Walked By Night" is a story of a family curse that haunts a seaside hotel. In 1750, a young fiancé is murdered by a jealous member of the Aram family. With his dying breath the victim curses the murderer. In 1950, a newlywed couple, Roger and Sylvia, come to the hotel where the visitors are terrorized by a shambling form from the sea. The curse of Aram arises a hundred years later. Art by Max Elkan. "The Cursed Pistol", a one-pager, follows a cursed gun that's responsible for many unfortunate deaths. In 1943. the owner wishes it to never kill again, and snaps it in half. Unfortunately he gets blood poison from breaking it and dies. 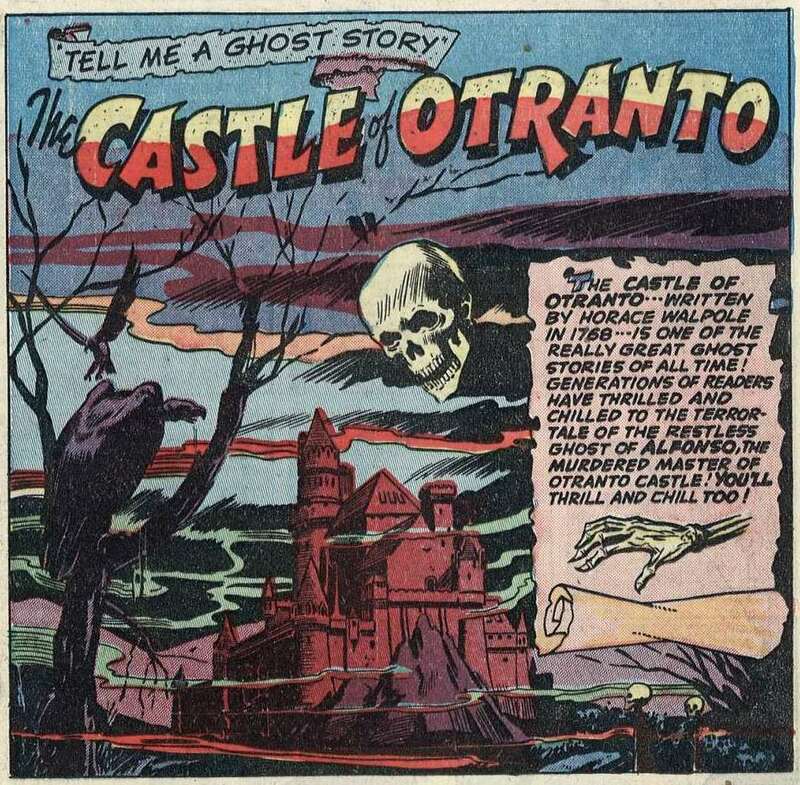 "The Castle of Otranto" is a worthy adaptation of the original novel by Horace Walpole that, appropriately, is the very work that inspired the Gothic tradition. 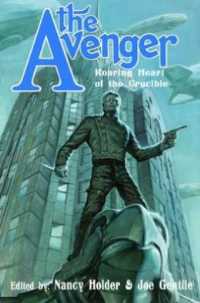 Long is able to take the frantic and messy book and turn it into a fairly reasonable comic story. 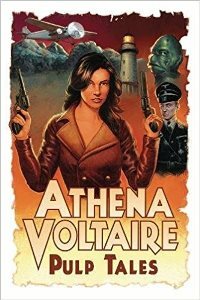 The art by Al Ulmer is adequate, but lacks historical accuracy. You'd never get a Hal Foster to do this strip though, so what can you do? "The Horrible Toys" is the second text story. In this one, two children, Jimmy and Jane, enter an abandoned house that had belonged to the witch, Mrs. Meek. 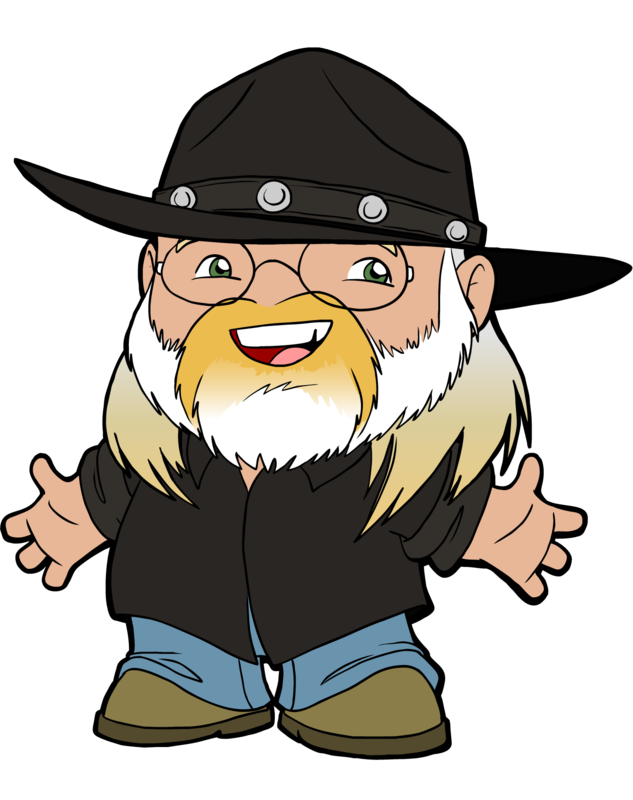 Long does a great job of writing a tale that children would find scary, even though to adults it might seem abrupt. "True Ghosts of History: The Vengeful Specter of Lord Tyrone" has Lord Tyrone and Lady Beresford making a pact as children to visit the other if they should die. Lord Tyrone dies and goes to the lady, telling her of the future and that she will die on her 47th birthday. This story is based on a famous "true" ghost incident. "Haunted House" features Benny and Fred of the Eager Beaver Detective Agency. Fred's girlfriend is to get a million dollars if she can spend one night in the haunted house she is to inherit. Ghosts, clanking chains, and a creepy portrait of an old man holding a cane are all props in this tale. To no one's surprise, the ghosts turn out to be the lawyers who have embezzled all of the inheritance. This story has a more humorous feel than the rest of the issue as it is a familiar plot of several movies including Abbott and Costello's Hold That Ghost (1941). 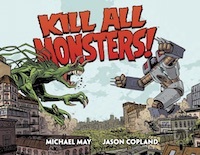 The art by King Ward is my favorite of the issue, having a goofy feel that is perfect for a madcap horror tale. 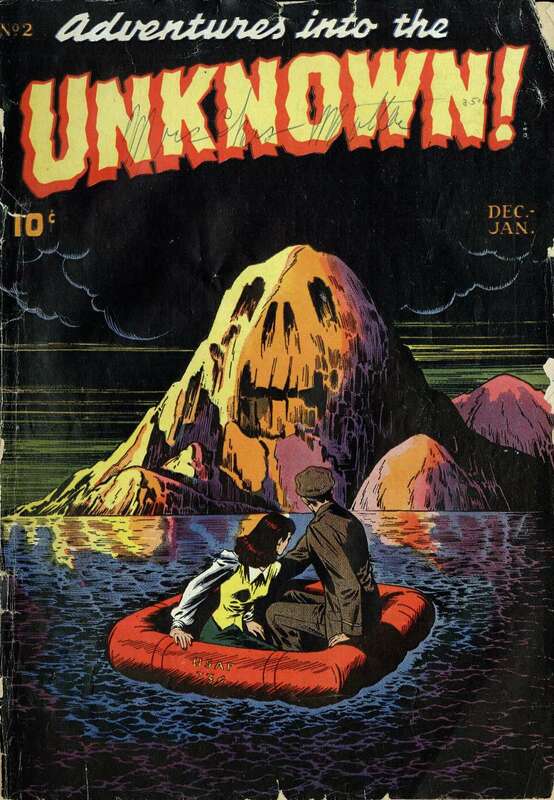 The second issue was December 1948/January 1949 and featured another Edvard Moritz cover, this time with people in a rubber dinghy about to land on an island with a creepy skull like mountain. The dark blue and orange is perfectly lurid. "The Mermaid Mole" is a text story about a man who frames his hated rival for murder. Fifteen minutes after the man is hung for the crime he didn't commit, his ghost appears before the liar and strangles him to death. The dead man is found to possess a mermaid shaped mole that had been on the executed man. "Living Ghost: Out of the Unknown" has Gail Leslie and Tony Brant relaxing after their meeting with the Living Ghost. The villain shows up and kidnaps Gail, sending Tony to Dr. Vandyke for help. In the doctor's office, Tony sees a weird monster that proves to be the Living Ghost's greatest enemy, the Dark Phantom. In the end, Brant has to deal with two monsters. Edvard Moritz does a good job of imitating Fred Guardineer's work from the previous issue. 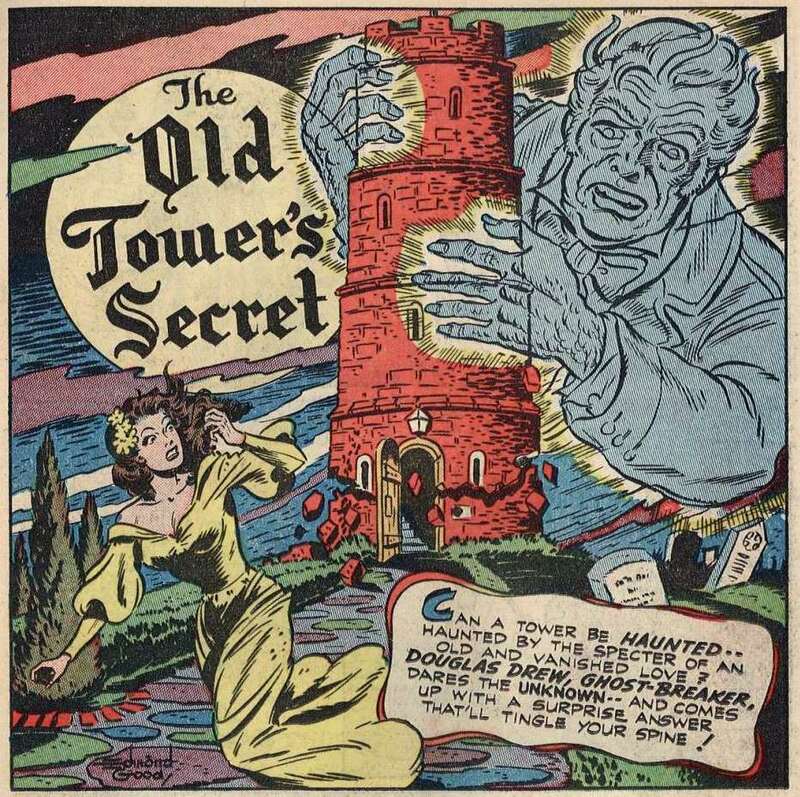 "The Old Tower's Secret" features an official ghostbreaker, Douglas Drew (not to be confused with Dr. Desmond Drew, created by Will Eisner in 1949). An ancient locked tower is protected by the ghost of the man who locked it forever. Dr. Drew and his companions enter the tower and solve a 100-year-old mystery. Art by Edmond Good. "The Haunted Hoard" is a text story about Jimmy Severn, a man so desperate for money he is willing to enter a haunted house to look for rumored gold. What he meets is an old man in old-fashioned grab who gives him a bag of gold, and tells him never to return. Some weeks later he sees a picture of the fellow, who was the man who was murdered in the house long ago. "The Master's Hand" returns to the "Pickman's Model" idea, telling of an art student, Betty Saunders, who has thoroughly studied the great macabre artist Kees van Ruyter. A mysterious man hires her for her artistic abilities, but when Betty arrives in Europe, she finds that her patron is a ghoul who plans on conjuring all the phantoms and monsters from van Ruyter's paintings. And Betty will paint new ones to expand his army. Only the phantom van Ruyter himself can save her. Art by Max Elkan. "Phantom of the Seas" has Captain Wolfson strangled by his mutinous crew, then his spirit is trapped in a bottle with a model of his ship. In the present day, the Knowles family buys the ship-in-a-bottle and young Stephen uncorks it, releasing the ghost. Only the connection between the ghost and the ship will save them. Art by Paul Reinman. "True Ghosts of History: The Grim Lady of Raynham Hall" is based on actual events in the life of Fredrick Marryat. The nautical author sought out the spectre in the Norfolk country house in 1836. The author's daughter, Florence, wrote of the incident in 1917. In 1936 reporters from Country Life went to the house and took photographs of the phantom, considered to be fakes today. Long incorporates both Marryat and the reporters' versions in this two-pager. Art by King Ward. And here Frank Belknap Long steps aside for others to take up the work he created. Artists like Al Feldstein who came on with issue #3 and later would be key at EC. But Long's participation with AitU didn't stop there. The publisher grew uneasy when the first public alarm arose around horror comics. Only a request from Long to friend and editor August Derleth secured a letter from Arkham House sanctioning horror comics. This letter in turn quelled the nerves and allowed AitU to go on for 174 issues, weathering the "Seduction of the Innocent" crisis of 1954 and only ending in 1967. 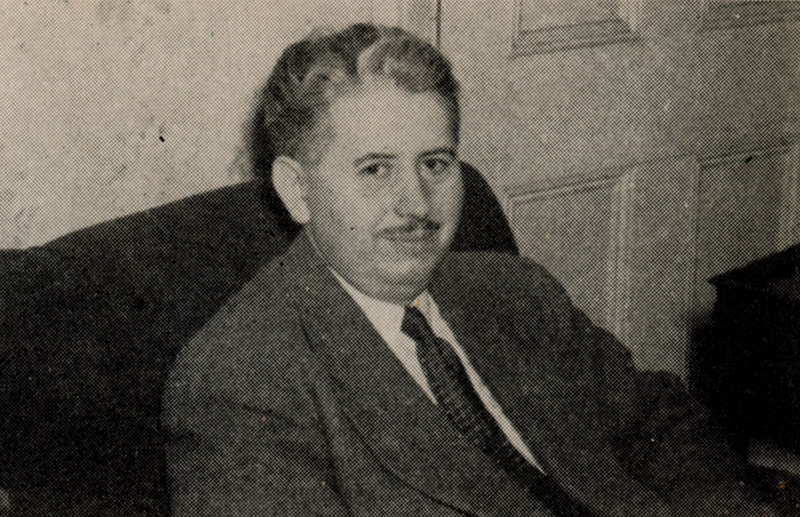 Without Frank Belknap Long, the entire genre of horror comics might not have existed! 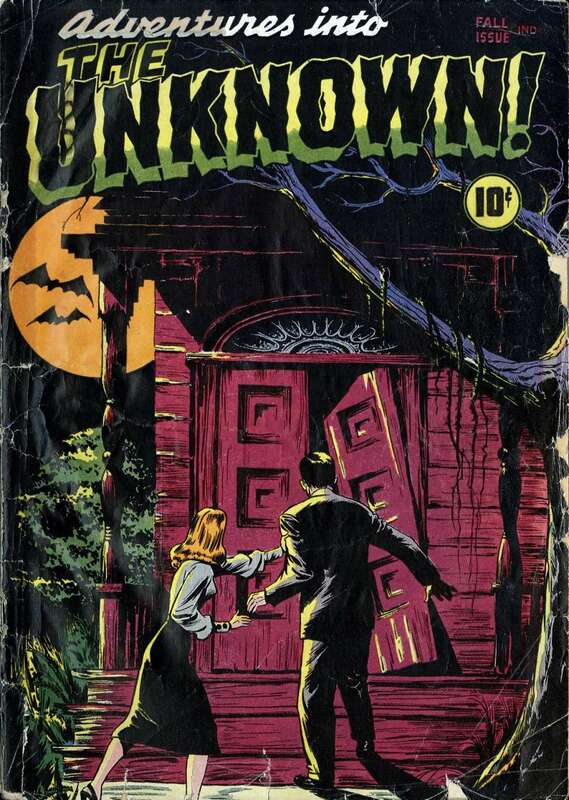 Both issues of Adventures Into the Unknown are in the public domain and available at Digital Comic Museum and Comic Book Plus. For all the details on Frank's career in comics I recommend Worlds of Weird.